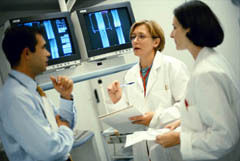 Click here to learn more and visit the Center for Patient Safety Research and Practice website. Pilot Testing Fall TIPS (Tailoring Interventions for Patient Safety): a Patient-Centered Fall Prevention Toolkit Dykes PC, Duckworth M, Cunningham S, Dubois S, Driscoll M, Feliciano Z, Ferrazzi M, Fevrin FE, Lyons S, Lindros ME, Monahan A, Paley MM, Jean-Pierre S, Scanlan M. Jt Comm J Qual Patient Saf. 2017 Aug;43(8):403-413. A web-based and mobile patient-centered ''microblog'' messaging platform to improve care team communication in acute care.Dalal AK, Schnipper J, Massaro A, Hanna J, Mlaver E, McNally K, Stade D, Morrison C, Bates DW. J Am Med Inform Assoc. 2017 Apr 1;24(e1):e178-e184. Acute care patient portals: a qualitative study of stakeholder perspectives on current practices. Collins SA, Rozenblum R, Leung WY, Morrison CR, Stade DL, McNally K, Bourie PQ, Massaro A, Bokser S, Dwyer C, Greysen RS, Agarwal P, Thornton K, Dalal AK. J Am Med Inform Assoc. 2017 Apr 1;24(e1):e9-e17. Nurse, Patient, and Care Partner Perceptions of a Personalized Safety Plan Screensaver. Duckworth M, Leung E, Fuller T, Espares J, Couture B, Chang F, Businger AC, Collins S, Dalal A, Fladger A, Schnipper JL, Schnock KO, Bates DW, Dykes PC. J Gerontol Nurs. 2017 Apr 1;43(4):15-22. Validating Fall Prevention Icons to Support Patient-Centered Education. Leung WY, Adelman J, Bates DW, Businger A, Dykes JS, Ergai A, Hurley A, Katsulis Z, Khorasani S, Scanlan M, Schenkel L, Rai A, Dykes PC. J Patient Saf. 2017 Feb 22. Iterative user centered design for development of a patient-centered fall prevention toolkit. Katsulis Z, Ergai A, Leung WY, Schenkel L, Rai A, Adelman J, Bates DW, Dykes PC. App Ergon. 2016 Sep;56:117-26. Falling throught the crack (in the bedrails). Dykes PC, Leumg WY, Vacca V. PS Net Web M&M 2016 May. User-centered design of MySafeCare Patient Safety Reporting System. Couture B, Cleveland J, Ergai A, Katsulis Z, DeBord Smith A, Gershanik E, Collins SA. Membership Highlight Presentation at the New England Nursing Informatics Consortium Annual Conference: Trends in Clinical Informatics: A Nursing Perspective, April 2015, Waltham, MA. Strategies for managing mobile devices for use by hospitalized inpatients. Dykes PC, Stade D, Dalal A, Clements M, Collins S, Chang F, Fladger A, Getty G, Hanna J, Kandala R, Lehmann LS, Leone K, Massaro AF, Mlaver E, McNally K, Ravindran S, Schnock K, Bates DW. AMIA Annu Symp Proc 2015 Nov 5;2015:522-31. User-centered design of the MySafeCare Patient Facing Application. Couture B, Cleveland J, Ergai A, Katsulis Z, Ichihara N, Goodwin A, DeBord Smith A, Gershanik E, Chang F, Collins S A. Computers, Informatics, Nursing 33.6 (2015): 225-226. Web.